It is the most San Francisco restaurant ever. 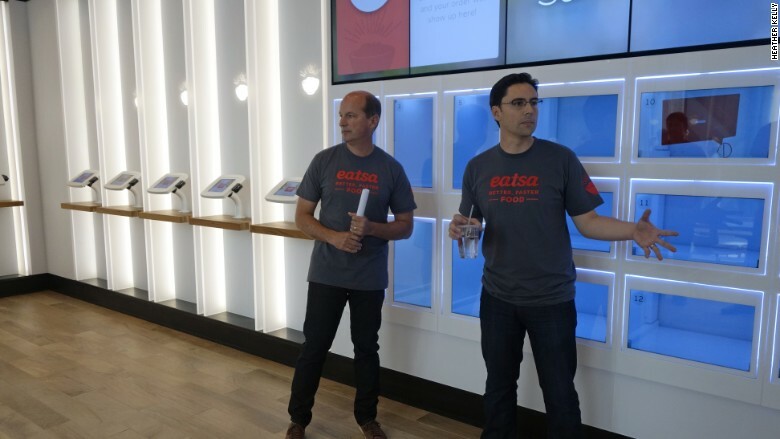 Eatsa is a new chain of quinoa-only automated vegetarian restaurants powered by iPads, where high-tech cubbies spit out your order. And yes, there is reclaimed wood and a mission to change the world. The restaurant is the first project of Keenwawa, a new venture-backed Silicon Valley startup that wants to disrupt fast food by making it healthy, affordable and accessible. Cofounded by Tim Young, Scott Drummond and David Freedburg, the key to Keenwawa's big dreams is quinoa. "It has the potential to be a savior," said Young, who sees quinoa as an alternative to animal protein. "It provides all these nine amino acids that people need to survive. It really is a superfood." A protein-rich seed from the Andes, quinoa is nutty and hearty. Eatsa has eight menu items that use it as a jumping off point for salads and dishes like curry or burrito bowls. Easta co-founders Scott Drummond and Tim Young in their new quinoa restaurant. After months of beta testing in a mock restaurant (this is a Silicon Valley startup after all), the first Eatsa location officially opened in September in a heavily trafficked area of San Francisco's SOMA district. A smaller second San Francisco location opened March 24. On one side of the open space, there are iPads with credit card readers. The other half is taken up by a grid of gleaming "cubbies" under a giant LCD display. Place an order on one of the iPads or the mobile app. The system remembers what you order, so it can suggest other items you might like or make a note that you don't eat dairy or gluten. Real human workers assemble the food out of sight. When it's ready, your name flashes on the large screen with the number of a cubby. Double tap the glass display and the little door opens to revel your food. While Eatsa seems futuristic at first glance, much about the idea is quaint. In Silicon Valley, most food startups focus on bringing food to you so you don't have waste valuable time leaving your home or the beanbag at your open-floor-plan startup. And cashier-free restaurants aren't new. Automats have been serving up food via vending machines for more than a century, though they mostly died out in the U.S. decades ago. New technologies could give the genre a second life. Tablets and mobile payments cut down on cashier salaries and delays. Constantly collected data can be used to make the operation more efficient over time. Quinoa may be a superfood, but it is not without controversy. As it becomes more popular and its prices rise, local populations in quinoa-producing countries like Peru and Bolivia are turning to less healthy "Western" diets. Young says Eatsa is sourcing all of its quinoa from a distributor in Bolivia that works with small farmer cooperatives. Outside of San Francisco, the company opened another location in Los Angeles in December. And the chain has big dreams beyond the three stores. "We truly are looking to bring quinoa to the masses, " said Young. "You can crave healthy food and crave quinoa in time." Even, he hopes, first thing in the morning. This spring, Eatsa plans to add breakfast items to its menus. Yes, made from quinoa. Editors note: This story was originally published in August 2015. It was updated to reflect that new locations opened in December and March and that Eatsa plans to add breakfast items to its menu.